This is kayak was historically used for hunting wild reindeer on the lakes and rivers of the Anadyr region of Siberia. The Chukchi are one of a handful of non-Inuit cultures in the Arctic that use skin-on-frame canoes-- kayaks-- for subsistence. Other kayaks that are used for similar purposes can be found in Central Canada: The Copper Inuit kayak, the Nattilingmiut kayak, the Inland Iglulingmiut kayak and the Caribou Inuit kayak. 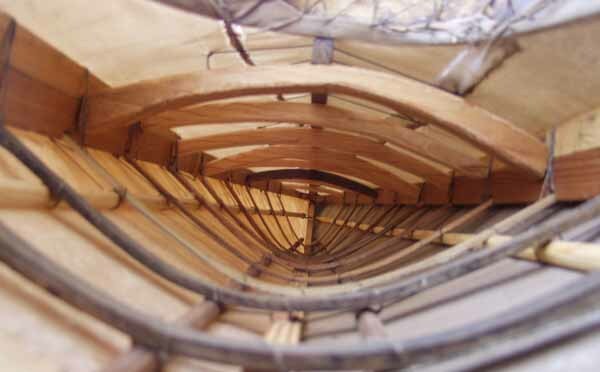 This kayak was built from a survey drawing in David Zimmerly's book "Qayaq: Kayaks of Alaska and Siberia." The original kayak dates from ca. 1904-07. Two views of the frame-- note the built-up gunwale. The completed kayak (11-2004). The hogged-bottom is clearly evident here. On The water: March 2007, Whidbey Island. Three Siberian Skin-Kayak types: (Front to back) Koryak, Maritime Chukchi, and the Inland Chukchi example above.